Planning Charlotte Mason lessons makes them more engaging and worthwhile. A homeschool mom mentioned recently that they have a hard time figuring out what the Charlotte Mason philosophy would actually look like in their home. This comment made me realize that while there is so much great information out there about the philosophy, there isn’t much that describes what a lesson would look like. I’m noticing that the general advice out there for preschool is Play outside, read living books, and then play some more. For older students, it seems to be, Read living books, talk about them, and narrate them. While I definitely agree with both of those thoughts, there are some of us (ahem…me!) who have a hard time with abstractions like these. We need something more concrete to grasp so we can understand what this philosophy looks like when it is being used correctly. 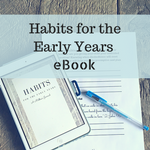 Even though I mostly write about the early years, I decided to explain what a formal lesson looks like (ages 6+). I learned about planning these lessons when I was a teacher at an Ambleside School. However, I don’t want to write about anything that is specifically from Ambleside Schools, so as I read through Home Education (almost done!) I take mental notes on what Charlotte Mason’s approach to a lesson looks like. I put together this step-by-step guide to lesson planning using what I’ve learned as a public school teacher, Ambleside teacher, and through reading Charlotte Mason’s volumes. When I describe the lesson planning process, I’m referring to subjects taught with living texts (not math, for example. I’m still trying to wrap my head around the math approach!) I probably don’t need to say much about living texts, because I wrote about them before (in How to Choose Living Books and Why Are Quality Texts Important for Children?) Also, if you follow a curriculum like Ambleside Online, you don’t have to do much of the choosing on your own. The Charlotte Mason approach simply will not work as well with books that aren’t packed with solid writing and inspirational ideas. I know it’s tempting to write the page numbers down and call it good, but masterly inactivity truly involves preparation! Reading the text ahead of time allows you to identify the inspirational ideas you’d like your child to focus on, and lets you to look up vocabulary words that you’ll need to identify later. If the thought of reading ahead is completely overwhelming to you, I have a suggestion. Sit down with the book whenever you have the time: over the summer, on the weekend, etc. Simply read the book for enjoyment, underlining ideas or words that stand out to you. When you are ready to plan for that book, look at your notes and you should be able to quickly identify the important areas to discuss. In Home Education, Charlotte Mason said that we don’t need to identify and define vocabulary words for students when introducing a text. The thing is, now research shows that students will understand and enjoy the text better when they know most of the words. The key here is to not make it about the actual word, but about the text. There will be no fill in the blank quizzes about the meaning of a word. No multiple choice saying, “What does ‘fruitless’ mean?” There’s a good chance you’ll see the word again in another text, and that repetition is what Charlotte Mason said will really secure the meaning of the word. Creating a mental image is crucial in this philosophy! The amazing thing is that modern research shows how students who are classified as “good readers” make a picture in their minds while reading. This is what I used to call, in twaddle-speak, “a movie in your mind.” So, when you set up a Charlotte Mason lesson, think about what will help make the text understandable, more enjoyable, and visible in your child’s mind. Don’t go overboard here. The lessons are meant to be short! In a history lesson, a map makes sense. Kids love to look at maps! That will help them imagine the land where the story takes place. For poetry or literature, reading a quick blurb on the cultural context might be helpful. Is there a piece of fine art related to what you’re reading about? Show your child. When you’re new to Charlotte Mason, or your child struggles with certain habits, I think it’s important to show children how to draw ideas out of the text. Once they have lots of practice in this area, they get really good at finding the ideas on their own. But until then, you can draw out the ideas with questions. These should be open ended and related to the idea, without blatantly saying, “What do you think about the idea that once your are real, you cannot be unreal?” (for example!) Often when we think of masterly inactivity, we think we can’t say anything. But I think I’ve mentioned this before- masterly inactivity is not just inactivity- it’s masterly, too! Think of how your child will do narration. Each lesson should include telling back, or narration. The standard approach is to have your child tell you out loud what they just read. Older children can write out narrations. You can brainstorm to see what will work for you and your child. Warning- there are lots of appealing narration ideas out there that look a lot like twaddle to me! Here’s how I think you can gauge this: if the narration is more about the process than about the content being shared, it’s probably not worthy work. There’s no need to waste precious time in fancy telling back productions! You can grab my lesson plan templates here to help you with planning! I have a couple more posts on this topic coming up, so make sure to check back here soon so you don’t miss them! I’m new to homeschool and to Charlotte Mason, and my kids come from the traditional school system where their teacher was telling them what they should write and think, so how would you show children like this how to draw ideas out of the text? I’m floundering with my lesson planning since I’ve never done it and your post is extremely helpful so, thank you! It is definitely a big transition from traditional schools to Charlotte Mason! When my students were new to the method, I would guide them pretty specifically, with a question like, “What do you think about this line?” (A line that represents an idea.) Once they got more used to it, an entertained or perplexed look on my face would show them that there was something worth thinking about! Our homeschool is a conglomerate of so many different methods, but living books are really the core of our home education routine. Thank you for this wonderful picture. I’ve realized that our home is much more Charlotte Mason-like than I realized! How neat that you’ve used it kind of intuitively! Living books are my favorite part. That is what made immediate sense to me when I left public schools for Charlotte Mason!